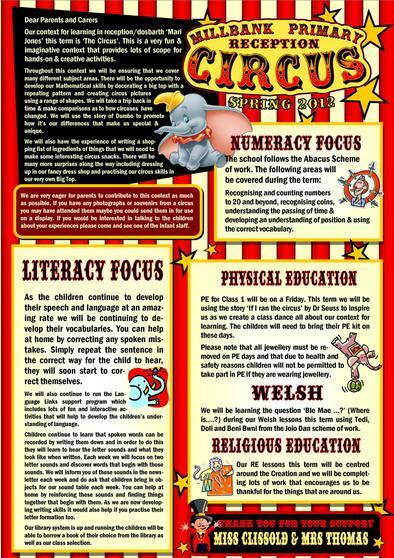 Hello & welcome to Reception Class, in the Spring Term 2012 our context for learning is the Circus and we hope to have lots of fun learning on this theme. Just click on the sheet Left to read about what we are doing and how you can support your child's education. Miss Clissold is our teacher supported by Mrs Thomas. Our class is also called 'dosbarth Mary Jones' after the inspirational of the Welsh girl who walked 25 miles to buy a bible in her bare feet. This story reminds us about the UNCRC and article 17 which says we should have information like books. Below are some of the photographs of the class but you can see lots more of us with other classes in the events page or in the clubs too.